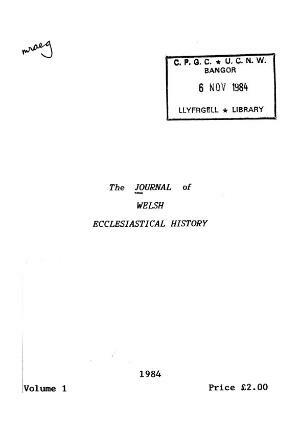 The Journal of Welsh Ecclesiastical History was an annual English-language journal containing academic articles and book reviews on Christianity in Wales. It was published from 1984 to 1992, when it became the Journal of Welsh Religious History. Publisher Details: The Revd John R Guy and the Revd Roger L Brown edited and published the Journal of Welsh ecclesiastical history under the name the Tair Eglwys Press, Tongwynlais, Cardiff.